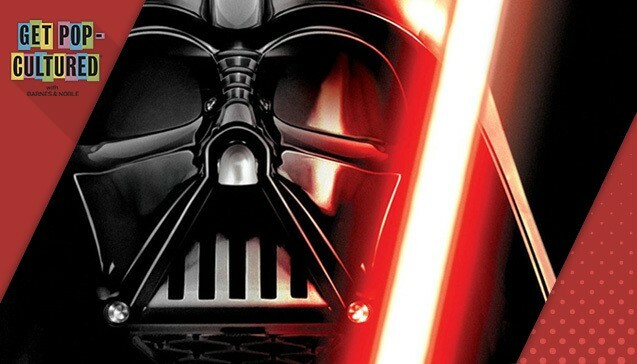 Attend FREE Star Wars Saturday at Barnes & Noble on July 18! Join the Force as Barnes & Noble celebrates all things Star Wars on Saturday, July 18th. This is a FREE event! Fans of all ages are invited to join in on the fun for exclusive products, activities, cosplay, trivia and for a chance to win a Star Wars character standee (no purchase necessary. Must be 13 or older). While you wait for the Star Wars fun to begin, immerse yourself in the galaxy far, far away with Star Wars transporting movies, books, and toys. 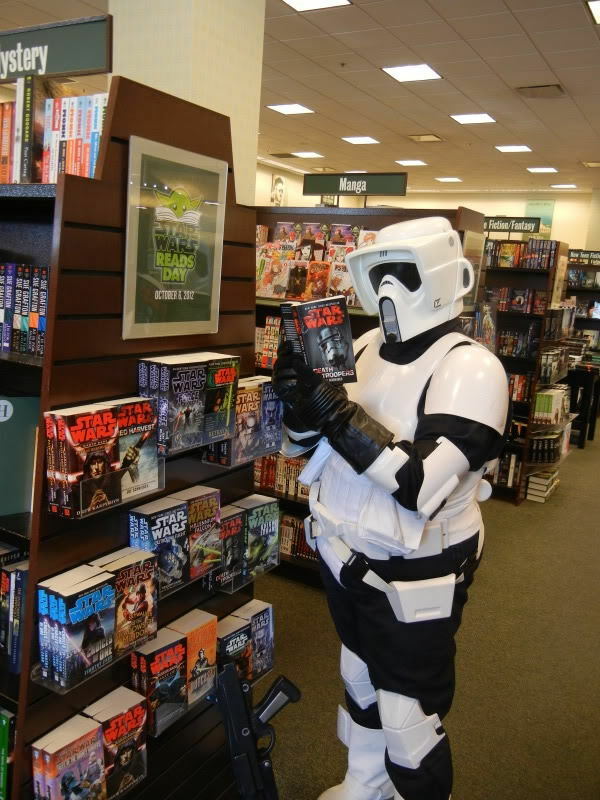 For more information about Star Wars Saturday, contact your local Barnes & Noble store. Disclosure: This post is for informational purposes only. All points of view are my own. I love farm tours! My children and I have been on several field trips to various local farms throughout Southern California. Each time we go we learn something new about where our food comes from and how it produced. So much so, that last February I wrote a blog post entitled 20+ Farm Tours for Kids in Southern California. 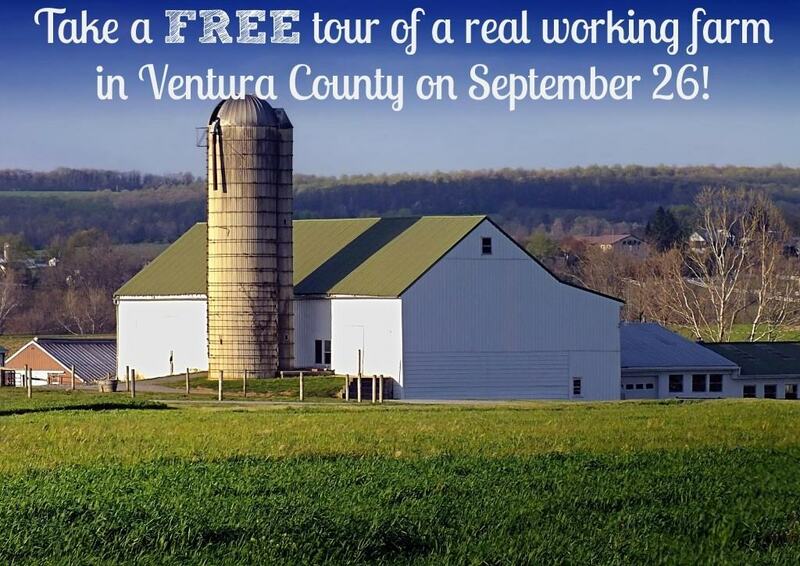 On Saturday, September 26, SEEAG (Students for Eco-Education and Agriculture) is pleased to invite the public to visit and tour over 20 working farms in Ventura County for the 2015 Ventura County Farm Day! Self guided tours run from 10 am to 3 pm. This FREE, multi-location and self-guided event will feature unique tours, hands-on activities, educational demonstrations and an artisanal farmers market that will showcase the farmers and farm lands that produce foods and goods such as lemons, strawberries, tomatoes, onions, avocados, olives, goat milk soap and more! Houweling’s Tomatoes – Come tour a world-renowned greenhouse tomato facility and sample delicious hydroponically grown tomatoes. McGrath Family Farm – Pick your own organic strawberries or shop in season at their roadside farmer’s market right off the 101 Freeway in Camarillo. Chivas Skin Care – Meet their goats, pigs, tortoises and chickens, and learn how they handcraft goat milk soaps. Tours on the hour, soap showroom open all day. Bartels Ranch – Tour and learn about everything you wanted to know about Valencia oranges. Otto & Sons Nursery – Tour their full selection of roses, fruit trees, berries, and general landscape plants. East End Eden Farm – Meet and greet the Farmer Connor Jones, and tour a permaculture food forest with a large variety of fruits and vegetables, as well as goats, pigs, chickens and more. Friends Ranch – Ojai citrus history, family lore, fresh-squeezed juices and taste tests ​of​ a variety of seasonal citrus fruits. On this special farm day folks will be allowed to squeeze their own cup of juice and taste the way real orange juice should taste! There will also be a blind taste test of fresh-squeezed orange juice versus some of the popular store brands. Ojai Valley Olive Oil – Tour olive press house and taste cold-pressed olive oil. AQC Laboratory – Tour a high-tech laboratory that specializes in agriculture and food safety. Deardorff Family Farms – Tours of our LEED Certified, sustainable, “green” facility will be every hour starting at 10:15. We will have 2 tours going on, led by Scott Deardorff, one of the owners of Deardorff Family Farms, and Joe Diaz, our Facility Manger. Each of the 2 tour groups can have about 20 guests. Christine Smith will be at a booth in front of the building, sharing about DFF and letting guests sample fresh produce! Duda Farm Fresh Foods – Walking tour operation with viewing of fresh-cut celery facility. Display of products and samples given out prior to departure of guests. Gill’s Onions – Visit one of the largest fresh-cut onion operations in the nation and the 10th largest grower on the West Coast. Learn how this processing plant in Oxnard is 100% waste-free by turning its onion waste into bio-fuel to generate electricity. Mission Produce Avocado Packing House – Tour one of the largest avocado producer’s packing house in Oxnard. See all the steps, from washing to grading, to shoring and packing avocados. San Miguel Produce – Tour a packing facility that is a vertically-integrated grower, and fresh-cut processor and shipper specializing in dark leafy greens with brands San Miguel Produce, Cut ‘N Clean Greens, and Jade Asian Greens. Hansen Agricultural Research and Extension Center – Tour a farm that has a very active education outreach program. Hansen has 4-H youth agricultural literacy programs including farm field trips and classroom outreach serving K-5th-grade students countywide. 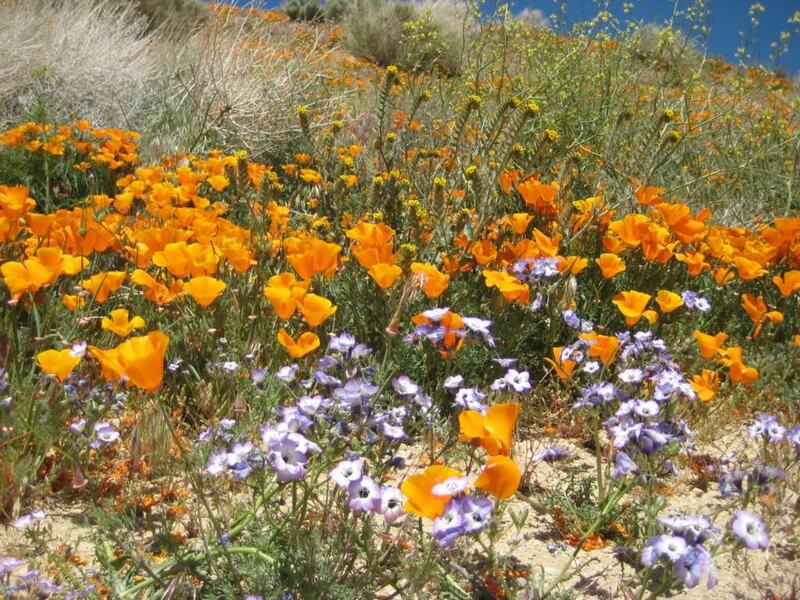 Additionally, the Center is an approved site for the VC Master Gardener Program. Limoneira Ranch – With nearly 3,200 acres of agricultural production in Ventura County and 11,000 total around the globe, Limoneira is one of the largest providers of lemons and avocados in the United States. Tour the grounds from a hay ride and tour their historic visitor’s center. The End-of-Day BBQ will be held at Limoneira’s north lawn starting at 4 pm. The Painted Pony Farm – Wool washing, goat milk soap making, apple pruning, seed collecting and late season apple picking. We will have goat milk skincare products and imprinted t-shirts,bags and hats for sale. Petty Ranch – Meet-and-greet the farmer, U-pick, citrus, avocados, figs and other speciality fruit. Underwood Family Farms – Large variety of seasonal fruits and vegetables. Explore the Somis Farm Animal Center. Rincon-Vitova Insectary – Take a tour of a producer and distributor of beneficial insects and other natural organisms for biological, organic pest control. After tour hours have concluded, locals are invited to enjoy a rustic outdoor BBQ at Limoneira Ranch in Santa Paula starting at 4 pm. The BBQ will feature live music by Grammy Award-winning artist Todd Hannigan, a kiss-the-farmer photo booth, tractor rides, gourmet salads prepared by farm-to-table Chef Jason Collis, craft beers from Poseidon Brewing Company, small batch wines from Four Brix Winery and barbecue fired up by the Young Farmers & Ranchers of Ventura County. Tickets to the Limoneira BBQ are available for purchase online now. One of my life long dreams is to take my family to visit Israel to experience what it was like to live during Biblical times. To float in The Dead Sea. To take a boat ride along the Sea of Galilee. To sit at the Mount of the Beatitudes where Jesus preached the Sermon on the Mount. To see the Wailing Wall, a remnant of the great retaining wall around the Temple Mount platform, which has been a place of Jewish prayer and devotion since the destruction of the Second Temple by the Romans in 70 CE. But for now my dream of visiting Israel is out of reach. My children are too young to travel that far and my husband and I haven’t started our “dream vacation fund” quite yet. It will definitely be a few more years before we can visit Israel. So what can I do in the meantime to learn more about Biblical history and the ancient world? 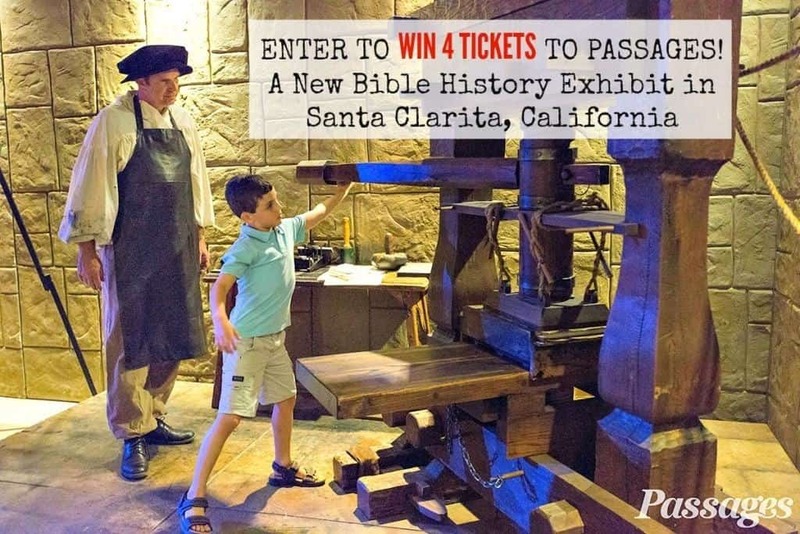 Take my family to visit Passages in Santa Clarita, California! 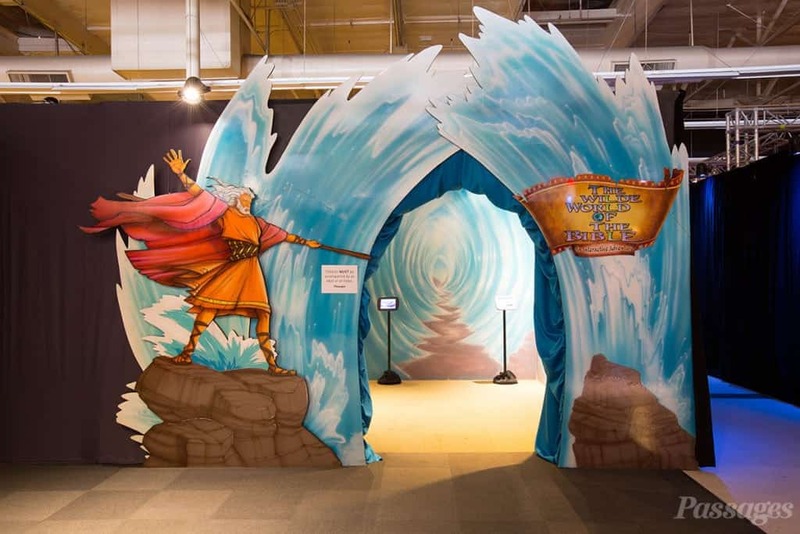 Passages is a 30,000-square-foot, interactive exhibit presented by Museum of the Bible that chronicles the remarkable history of the Bible, from its transmission and translation to its impact and controversies. It is a remarkable exhibit for people of all faiths and religion to experience. 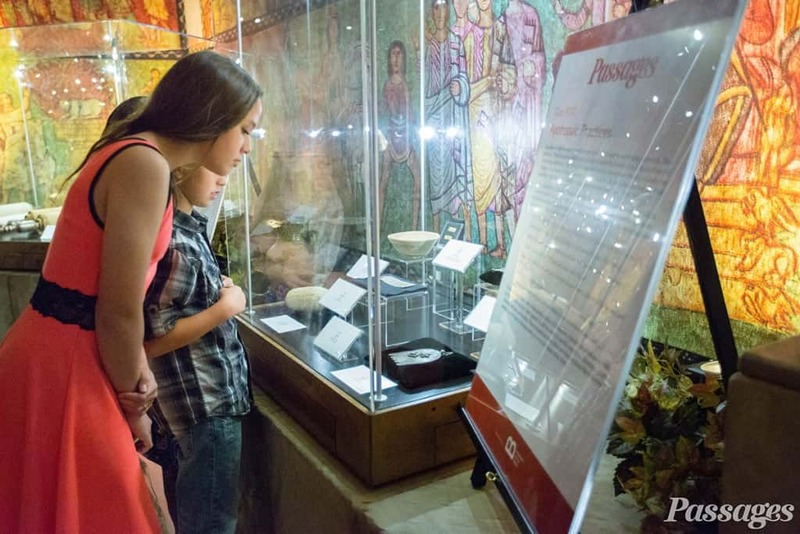 There are over 400 priceless artifacts used to tell the stories at Passages including Dead Sea Scroll fragments, centuries old cuneiform tablets that date back to the time of Abraham and a Bible that traveled to the moon on Apollo 14. Translation – See how the process of translation has made the Bible accessible to many different cultures while still remaining true to the original text. See a first edition of the King James Bible, printed in 1611 under the reign of King James I of England. Meet St. Jerome, a scholar who spent over 30 years translating the Bible into Latin from the original Hebrew and Greek texts. Plus get a chance to translate an ancient manuscript under candlelight! Transmission – This gallery explores the process of textual transmission from its earliest form to the 20th century. Try your hand at printing on a replica of The Gutenberg Press! 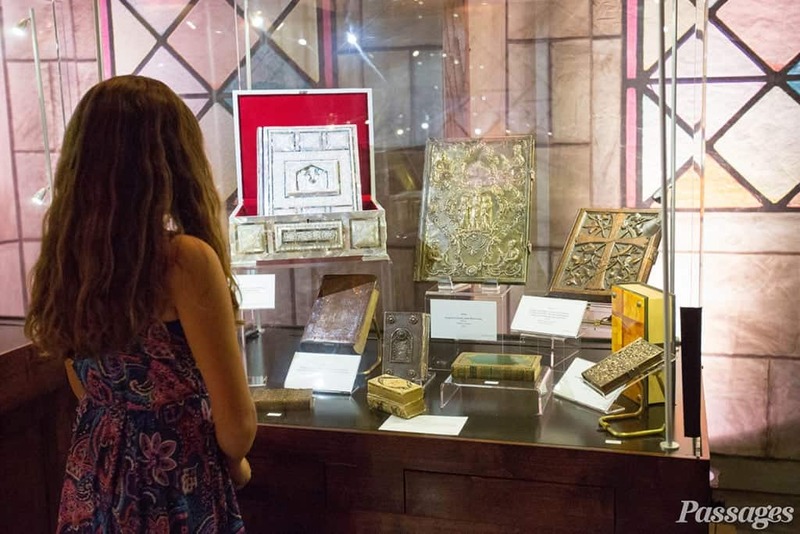 Impact – This gallery presents just a few of the many reasons why the Bible is widely considered the most influential book ever written. See the original manuscript of “The Battle Hymn of the Republic” by Julia Ward Howe, which demonstrates the impact that the Bible has had on music and popular culture. Learn how the Bible has influenced Judaica and the religious practices of Judaism. See stained glass windows of the gospel writers which demonstrate many of the innovative techniques that immortalized Louis Comfort Tiffany’s name in the glass production industry. Controversy – Take a closer look at some of the more divisive moments in the Bible’s history. Many people, right or wrong, have used the Bible to defend their actions, even in situations as troubling as the defense of slavery or the Holocaust. See the Martin Luther Letter which was written and signed by Martin Luther on the night before he was charged with heresy, which provides valuable insight into the thoughts of the most important theologian of the Reformation. 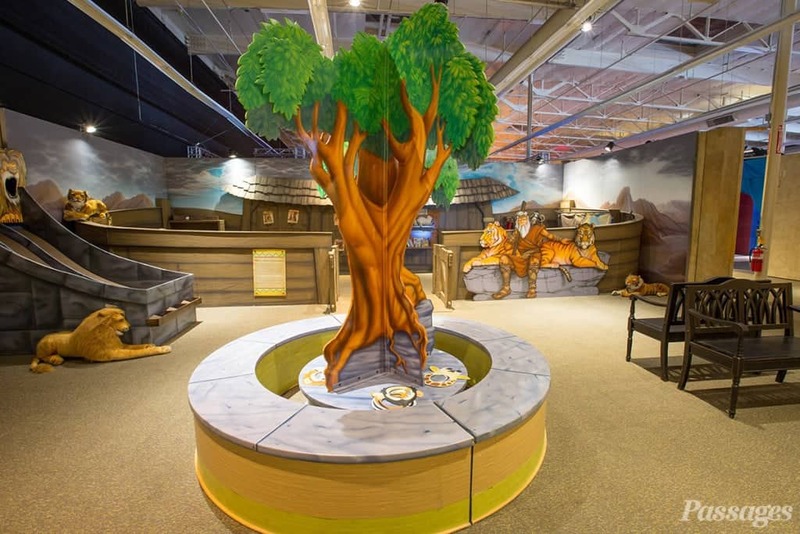 But I know my children will want to spend the majority of their time exploring the Wild World of the Bible! An area that is choked full of fun, kid-friendly activities. 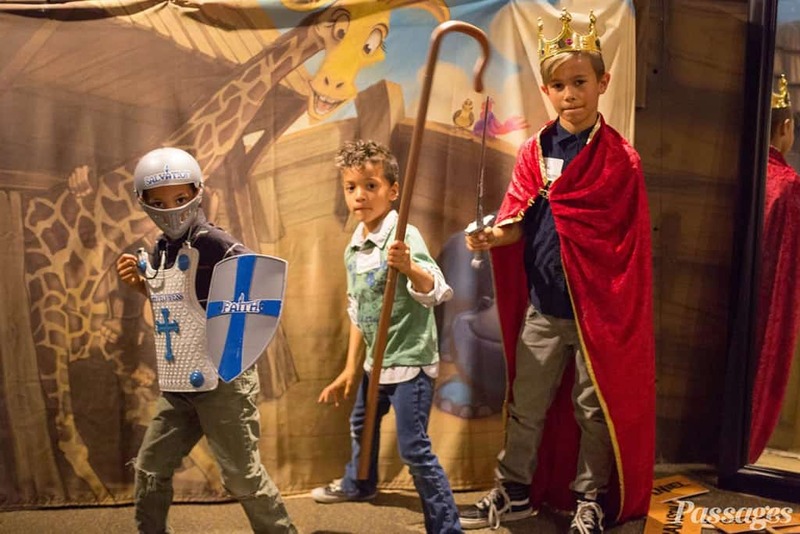 Here children can see, feel, do, hear and learn about the Bible at numerous stations. 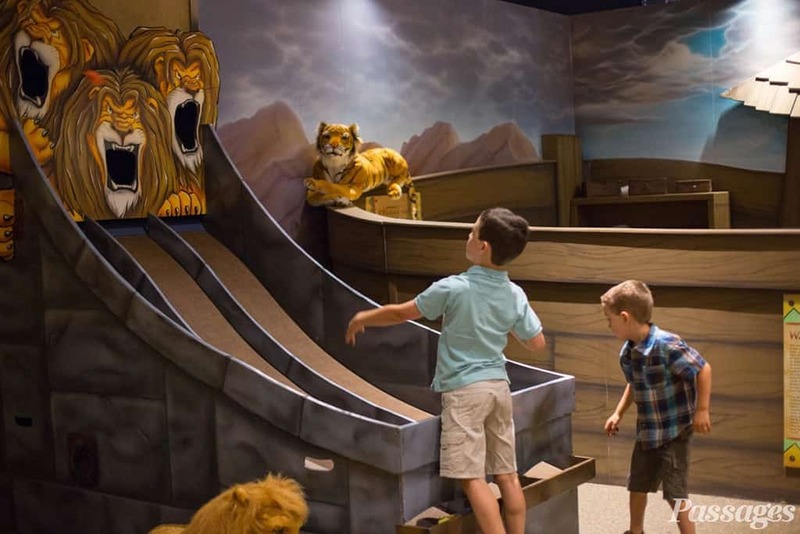 Be an animal on Noah’s Ark! Part the Red Sea with Moses! Feed the lions so they don’t eat Daniel! Act out a story or come up with your own in the popsicle stick puppet theater! Read a book, make a puzzle or play a game! Passages offers field trips and group discounts starting at $8 per student / $10 per adult. They also have educational resources that go along with each gallery and a treasure hunt for school age children. To schedule a group tour, call 1-888-297-8011. ATTENTION HOMESCHOOLERS! 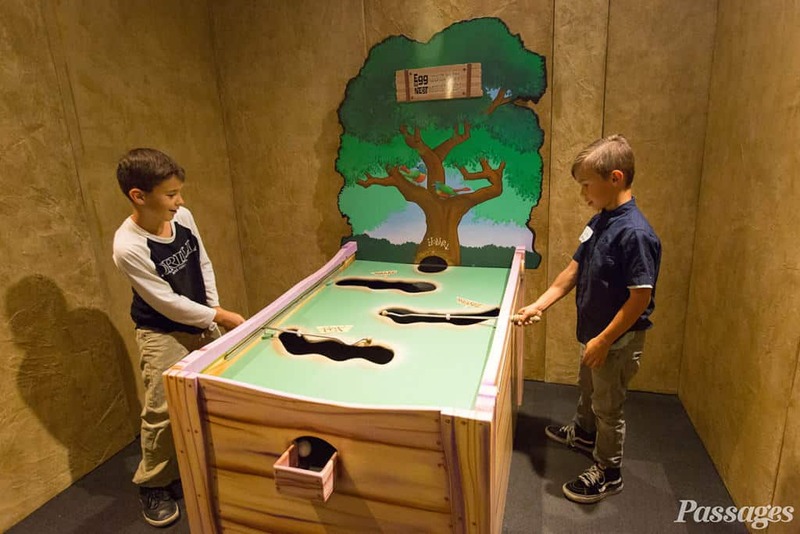 Once a month Passages hosts a special homeschool day just students and parents where you can receive half-off admission to the exhibit. Passages is located at Bouquet Canyon Rd, Santa Clarita, CA 91350 and is in Southern California through February 2016. 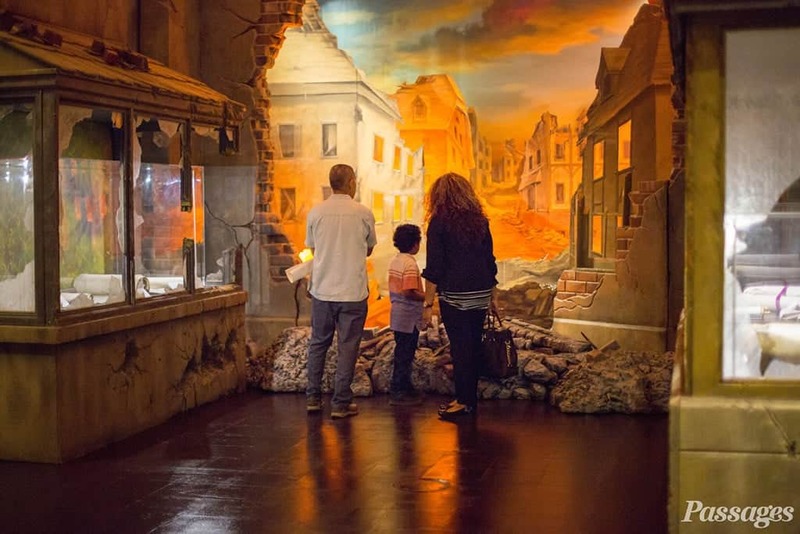 There is so much to do and see at Passages, that I might be able to put off our dream vacation to Israel for awhile! 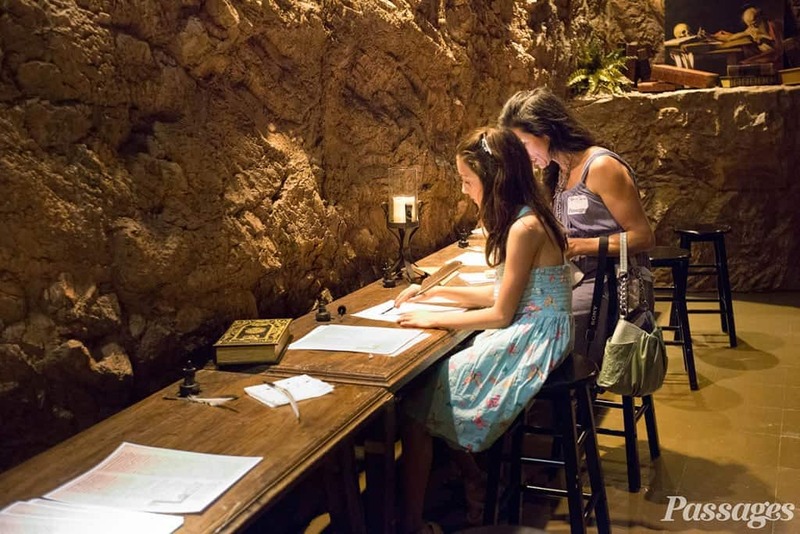 Now here’s your chance to enter to win 4 tickets to visit Passages! US Residents Only. No purchase necessary to enter. One winner will be randomly selected via RaffleCopter and notified via email. Winner must respond within 48 hours to claim the prize or a new winner will be chosen via RaffleCopter. The prize package will be fulfilled by the sponsor and arrive within 4 weeks after being selected. Disclosure: This is a sponsored post and for informational purposes only. All points of view are my own. All pictures are copyrighted by Passages and used by permission. 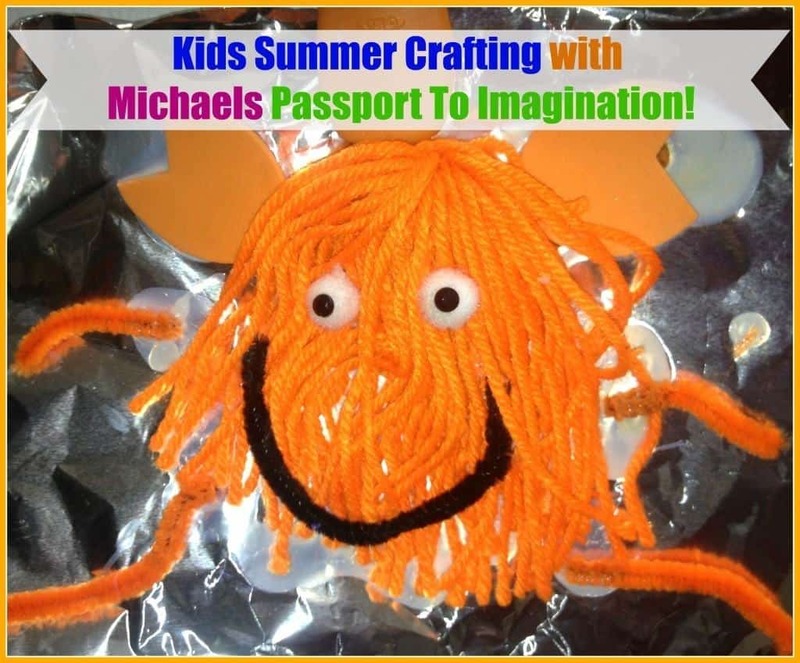 Kids Summer Crafting with Michaels Passport To Imagination! Where can children go for two hours this summer and craft till their little hearts are full? At Michaels Passport to Imagination classes! Michaels stores are making it so easy for parents and kids to get crafting this summer with their Passport to Imagination classes. Kids will have a chance to take a road trip this summer at classes being held on Mondays, Wednesdays, and Fridays from June 15 – July 31. 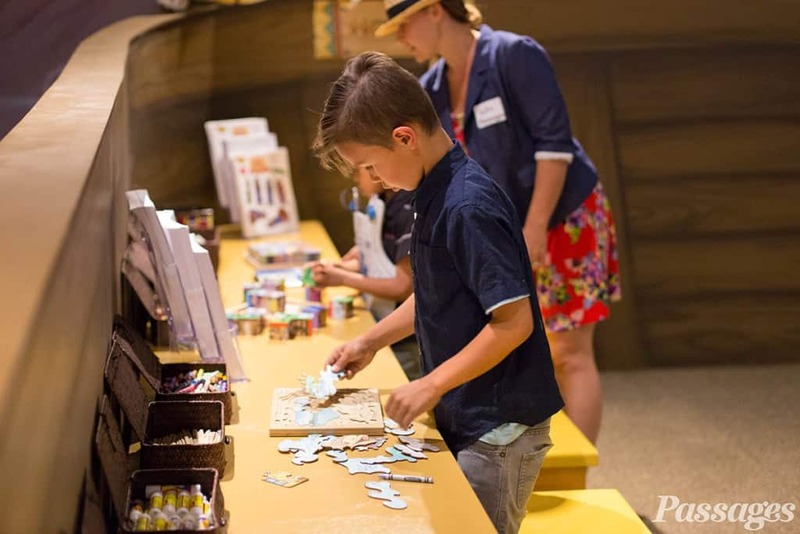 Each week a different road trip will be explored while kids enjoy doing a large variety of craft projects. One of the things I love about these 2 hour classes, for children ages 3 and older, is the affordability. Classes are only $4 per session or $12 for 3 sessions, including supplies. My Michaels store in Orange County has this neat display just as you walk in the door. It shows some of the fun craft projects kids have to look forward to this summer. Week of June 14 – Come explore the sea at Michaels. Make a pirate doubloon necklace and eye patch, a spyglass and treasure map and a feathery parrot puppet. Week of June 21 – Spend a week at the lake. Build a paper sailboat, create a felt feast for pretend picnics and make a magnetic fishing game to play. Week of June 28 – Let’s go to the county fair! Make a flower with yarn, create a craft stick Ferris wheel and use two paper plates and cup to build a hot air balloon. Week of July 5 – Take a stroll down Main Street. Make a pinwheel, a fun travel memory game and pretty faux stained glass. Week of July 19 – Don’t miss this week’s music festival. Create a fringed bell anklet, paint a canvas with a musical theme and craft a water bottle holder. Week of July 26 – Are you ready for flea market fun? Tape together a bead bracelet, a wallet or pouch and a make-believe camera with Duck Tape®. To sign your children up for this summer’s Michaels Passport to Imagination program visit their website.